Fall is here. Have you noticed the weather’s changing and nights are colder? Once upon a time, a thousand years ago, a boy discovers a trap door into a tower on a high, ominous mountain. The boy, a character in my newest novel Spiral, goes by the name of Little Hawk. Though his mother has forbidden it, Little Hawk has been longing to get to the top of the tower ever since his mother, his dog and he arrived at this strange, new place. Sliding through the trap door, he finds a ladder in the middle of the circular room leading to a hole in the roof high above. Pallets have been laid all over the floor as if waiting for someone to lie down on them. He finds corn in jars that stink with a strong smell like the drink the priests guzzle that makes them crazy. But he must get to the top! Carefully climbing the ladder to the next level, Little Hawk spies skeletons without heads arranged in a circle, their feet facing the center, as if it were a fire pit and they only wanted to warm themselves. What does Little Hawk do? He spits on the skeletons! You can download the complete Spiral ebook for only $3.99! Imagine Little Hawk and his mother traveling to dark, menacing Chimney Rock Mountain in Southwest Colorado from their home in Chaco Canyon, New Mexico. I had to see for myself! Check out My Road Trip to the War Gods of Chimney Rock, CO, a video with original music by Chris Goslow. Read Spiral on your Amazon Kindle, iBook, Nook, Sony Reader, Kobo, Palm, Desktop Computer or Tablet. What mother does not fear for her child? How far would you go to save your own child? In the excerpt from my new novel, Spiral, a mother is fighting to save her infant son from the tyranny of a group of Elders, those “wise ones” who rule Chaco Canyon and sacrifice children in the name of the Sun God. One afternoon just before dark, the three of them had just returned home when Owl Watching noticed a small object on the hard-packed floor. He picked it up. “What is it?” asked Willow as she carefully took off the heavy cradleboard with the sleeping child inside. “The Elders have been here,” he said, scowling as he held out the little copper bell. He grabbed Willow. “Too late? What do you mean? What should we do? Where can we go?” she cried. When her mother found out, she took the bell to the Master Pot Maker, and they threw it in the hot kiln. Together the two shaman women made powerful secret magic, chanting, threatening and howling with the wind to twist the Elders’ power and render it harmless. The bell melted in the fire, turning into a small dull stone. Now Owl Watching insisted Willow he and the baby leave his relatives’ house each morning. This way, he said, the Elders would not find them at home when they came back. Stepping gingerly over the icy brittle snowy ground, their little family traveled up and down the canyon in the frigid air, paying visits on the Coyote Clan. The baby was held out, admired and feted. People discussed a good time for a naming ceremony. Names were suggested for him. The winter was worse than any Willow could remember, the wind blinding, ripping through the canyon, and the daylight too short to stay any length of time at her mother’s house or to make pots. Owl Watching grew more worried with each day he ushered Willow and his son out into the cold. They both knew it was only a matter of time. Finally, Willow refused to leave the house. She was just too exhausted. Owl Watching said he was going out one morning to search for more kindling while Willow ground corn and the child slept close on the warm hearth. The baby boy was wrapped in his bunting, adorned with the necklace of turquoise and bird bone she had fastened around his tiny neck. How sweet he looked! Willow was daydreaming, admiring her baby when the Elders came again, the staggering men stomping and dropping snow and ice on the floor. She jumped up but not soon enough, for Thin Nose had already grabbed the infant out of her arms. The baby let out a scream. “No!” Willow cried, reaching for the child wailing in the Elder’s scrawny arms. “I’ll take that blanket too,” Thin Nose laughed, picking it off the floor. Surrounding them, the others began to chant, skipping with their bells around and around in a little dance. Afraid to pounce on him or grab her crying child for fear she might hurt him, Willow grabbed for the blanket instead. Thin Nose let it go as he held the baby higher in the air. The child began to scream. “Pray with us, sister,” said one Elder. “You should be honored we have chosen your child for the sun dagger,” another said. “Aeeeeah, Aeeeeah,” Willow screamed, choking, emitting high quivery gasps like a stricken coyote. “The perfect sacrifice!” Thin Nose called out, stumbling toward the door with his prize, Willow following, kicking at his boots wrapped with delicate metal bells. “Stop!” She screamed, lunging after him. Suddenly she saw Owl Watching hovering behind the deerhide door, which was flapping in the wind. Owl Watching rushed past her, shouting to the Elders, “Just the blanket!” He pulled it out of Willow’s hand and thrust it at the Elders. “You said you only wanted the blanket! Here! Here it is!” he cried, holding it up in front of Thin Nose and the screaming baby. “Give our child back!” Willow screamed. Holding the blanket, Owl Watching attempted to take away the baby. But he too hesitated for fear of harming him. The Elders’ feet tinkled as they pounded the ground, forming a circle around the child. Suddenly Willow leaped onto Thin Nose’s back. They swung around as if in a dance. Owl Watching tried to grab her. Tipping back and forth, the rest moved in closer, pushing, pushing. Thin Nose stumbled, almost letting go of the child and knocked Willow off his back. Lunging for the baby, Owl Watching fell sideways to the floor with her. Thin Nose held out the screaming baby in front of him for all to see as he and the Elders danced away. Owl Watching looked up just as they spirited his child out the doorway. “You brought them here!” Willow screamed, twisting out of his arms, turning on him. “They said they only wanted the blanket!” He sat up, desperate, dazed, still holding the blanket. Order Spiral, the prequel to Sundagger.net now! “Just ordered my copy. I so enjoyed Sundagger.net: such vivid depictions of place & time and such interesting characters. I lost many hours of sleep staying up late to read because I just had to know what happened next. “— Sarah F.
Order Spiral, the prequel to Sundagger.net, now! It was the most special of days, the fall equinox, a time of equal day and night in the canyon, the center of the world, and above the canyon too on the flat mesa tops with their sinkholes, badlands, scarce pinyon and twisted juniper. Willow waited by Chaco Wash in her best deerskin skirt, biting her lip. She stood very still, small for her age, fourteen, and sturdy, with long shining black hair falling to her waist. Each time Willow bit her lip, the single dimple in her cheek deepened. But what did that matter since Water Hunter was not there to admire it? She threw her sandals at a sagebrush tumbling by in the wind. What if Water Hunter did not come? But he must. She could not bear that possibility and so put it quickly out of her mind. Hoping for any sign of him, Willow squinted on tiptoe in the sunlight, her eyes following the sage, as her mother taught her, until it disappeared into the horizon. “Become the rolling sagebrush to find what you are looking for,” Mother had counseled. The soft autumn wind behind her blew her skirt out and away from her strong, taut body, but she didn’t feel the pleasure of the wind. Willow was troubled. The tumbling bush reminded her that her mother did not approve of her waiting here at the Great House, Pueblo del Arroyo, for Water Hunter. But more troubling was that the sagebrush had not shown Willow where he was. Nothing seemed to move in the haze beyond the wash. Willow scanned all the way to the south mesa gap where the People were gathering for the great celebration. She clasped her hands to her chest to stop them from trembling. Today the powerful and frightening Elders were climbing the Butte, as they did at each turn of the year, to implore the sun to bring rain. At the top where the sun dagger appeared, they made sacrifices so that the sun would bless the People. Soon Willow would hear their ominous shriek-chanting and the beat of their foot drums as they danced and prayed to the sun to return them to that perfect balance of light and darkness that their ancestors saw when they crawled out of the sipapu, a hole in the third world leading to this sacred canyon. Abandoning the thought of finding the disappearing tumbleweed, Willow focused on thinking like Coyote, scanning east, west, north and south. “Coyote, help me find him!” she called. After all, she was named after a coyote cub. Her secret, never-to-be-spoken name was Srahtzee, meaning Close to the Ground, an attribute of the clever coyote. But Coyote wasn’t helping her now. Willow blushed with pleasure and shame, recalling that she had told her secret name to Water Hunter. How then could he have forgotten she was waiting for him? Her heart dropped. She rubbed her eyes, hoping to see him loping over the desert; she would recognize him by his powerful frame and his uneven gait. “I have made friends with my one short leg,” Water Hunter had told her in his slow, quiet way the very day they met. She vowed his lame leg would be her friend too! She loved his one short leg as she loved all the rest of his big hunter’s body. Willow shivered with longing. How desperately she desired him this very moment. She ached to have him stand next to her now. Her mother would never understand. The sun of midday streaming down swallowed Willow’s compact shadow along with the shadows of the Fajada Butte and the Great Houses of the canyon. Behind her and across the grassy bottomland, the block-long, five-story complex that the Spanish centuries later would call Pueblo Bonito was marking the sun’s trajectory. It had been built to match the path the sun took across the landscape this very day, when all the shadows hid, and day and night were equal. At this moment everything was perfectly aligned. Every year at this time all the clans from far outliers journeyed to Chaco to see their shadows disappear too. And as always, Willow’s own Coyote Clan, and her mother especially, made the preparations for the Elders’ supplications on the Butte. Her mother’s people were shamans in their own right and once had been favored allies of the Elders, but no more. Oh, when would he come? Willow gave a little cry and pushed her fists into her eyes to hold back her tears. Carefully she placed her bare feet on the ledge of the gully above the wash and peered across toward the broken south mesa. A great fissure cut through the middle of the mesa, and through it the crowds were coming, chanting, blowing conch shells, and dancing with tinkling footbells. There were so many people! She hoped Water Hunter wouldn’t be coming from that direction. He never had before. Besides, he was of the Bear Clan, and everyone knew they came from the North where they served the High Ones on Standing Rocks Mountain. But he would come! He must. It would be like the first day when they met on the Great North Road, one full moon ago. She had been holding her little brother’s hand. Her mother was carrying her best bowl. Behind them traveled the entire Coyote Clan on their way to the Giving Place, laden with offerings to the ancestors in their best jars that they would smash when they reached the great hill of shattered potsherds. Willow had trusted Water Hunter at first sight when she saw him walking with the Bear Clan. She had heard of this famous diviner who found water where there was none, thus attracting the big game that followed the water. She was amazed when he singled her out, smiling over the crowd at her alone. Even her mother noticed and stopped to introduce her daughter to him, saying that the Coyote Clan welcomed the Bear Clan as cousins. It was the Bear Clan who, before migrating north, had laid the foundation for the newest of the Great Houses, Kin Kletso, where Willow and her mother and brother lived before the Elders forced them to move further away down the canyon. That day Willow felt so special. She had felt even more special when Water Hunter motioned her to walk beside him. It was midday then too and she could not see her shadow. The sun had been a shining orange ball in the sky, the land bleached and brown from summer drought, and dead stalks of flowering cacti spotted the sandy ground. They were walking slowly, she following his lead, enjoying the sunlight warm on her shoulders, bare breasts and arms. Facing ahead, her gaze was steady in her deep, dark eyes. Balanced, straight-backed, Willow paced herself to the hunter’s slow, up and down gait. “I will walk in a way that we will be together,” Willow had thought then. Her unspoken words filled her with satisfaction now as her eyes skimmed the brown rocks, the fissures and outcroppings, twiggy bushes and cacti, the whole landscape in harmony with her and the sun above. She felt her heart sing again. He must come. He promised. Recently my eldest son and music artist Chris Goslow and I talked about putting together a special gift bundle that is truly “all in the family.” We decided to offer a book/album package at a big savings for a limited time. Now you can purchase and enjoy my books, Sundagger.net and Dreamers, along with Chris’ albums, Waterfall and I Love You . In the short interview below, you can see how Chris and I share much in common creatively and are able to work well together. Want to skip the interview and go right to the bundle? Click HERE . 1. What does this mother-son bundle mean to you? Margaret: From as far back as I can remember, I have been writing away at my novels and my son has been playing music. The idea of presenting my fiction and my son’s music together in a fun way is just delightful, even magical. Chris: Personally, it’s very satisfying for me to support my mom’s creative accomplishments while sharing my own. Margaret: Four years ago Chris and I offered a Holiday Mother-Son Bundle for the first time, and I loved that experience. I was living up North in Sonoma County and would take the inscribed book and CD packages to a rural post office in Graton, CA driving along beside the apple orchards and vineyards in the green, winter mist. It was so fulfilling to me; I felt one with nature, the season, and my writing life. Back then we each had only one product, but now we both are offering two artistic works–four altogether. That’s a real achievement! 2. Talk about your working relationship with each other. Do you often help each other when it comes to creative projects, and if so, how? Chris: I remember being in grade school and hearing my mom talk about wanting to publish her books. I also had my own creative dreams, so for both reasons it was an especially important issue to me. Our creative paths have had a lot of parallels, even though obviously I have been focused on music, and she has been focused on writing. Then again, I also am a writer, and she loves music. In fact, the main character in Dreamers is also a musician. Margaret: Yes, I made Annie in Dreamers the violinist I wished I was when I was taking violin in grade school! As for how Chris and I work together, this year we started having a Monday work meeting via Skype. As usual with most of our collaborations, Chris came up with the idea. The original objective was to discuss our two different teaching careers since we are also both teachers, but we ended up talking about all the parts of our writing and music lives. For example, I’m typing my answers to this interview Q&A today during our Monday Morning Skype Meeting while at the same time talking and seeing Chris on my computer screen! Isn’t that magical! 3. Do you find it surprising that you are both artists? And did you always know you could work together this well? Chris: It’s not surprising. It’s just part of my life, always has been. I always felt an affinity with my mom and a closeness with her as well as a desire to help her be happy. So the seeds of our working together go back a long way. Margaret: No, it’s not surprising to me that Chris and I are both artists. The surprising part–the amazing part– is how necessary, how life-changing Chris is to my writing life, and how much a difference he makes. Sharing my writing life with him a practice I don’t want to ever stop. Honestly, it’s astonishing to experience how all my children work together with me and each other. Chris’ brother, Jonas, is a performing artist too as well as a consummate web designer. Jonas designed this website as well as my Sundagger.net website. Their older sister is a singer and teacher; Annemarie, with her eagle reader’s eye, was my first copy editor. 4. It’s clear that family is important to both of you. How does family influence your creativity? For example, do you write about your family, are any of your stories (or songs) based family experiences? Chris: Family influences a lot of my art over the last few years. In fact, my entire I Love You album came about from songs I wrote for my wife, Charr Crail, or about our relationship. Even my first album Waterfall included mostly piano pieces I originally wrote the first year I met my wife, specifically after she asked me for music that she could use with photography slideshows she was making. So in a sense, both albums are an outgrowth of our relationship. Margaret: Pretty much all my life I thought I would never write about my family because they were just too ordinary! Maybe that’s why I was so attracted to the ancient Anasazi of the Southwest, the characters in the “old world story” of Sundagger.net. But still I definitely drew from my own experience, using my own family as building blocks. And clearly, Dreamers is laid out against the backdrop of my life growing up in Pittsburgh, PA during the upheaval of the Civil Rights era. I stood on all the street corners the main characters, Thomas and Annie, did. Each contains a description, a voice, or an attitude of my own memories of my family, friends and lovers. Even the dog, Lucky, is based on my sister’s dog! All the music mentioned in Dreamers are pieces I played or loved myself. When I stand in my backyard and look up at the night sky, I feel both very small and very big. The small part is my physical body, the big my spirit, from which I am able to imagine any story. Each night it’s a different sky I see and a different story. All my stories begin with what I see from where I’m standing. It’s the forested hills, valleys and rivers of Pittsburgh, Pennsylvania in Dreamers. The Oakland Hills, San Francisco, Death Valley and Chaco Canyon, New Mexico in Sundagger.net. With my upcoming novel, Spiral, I take the old story family of Sundagger.net on the same migration route as the prehistoric Native Americans took in their struggle to survive in a dying culture, one that built Great Houses as big as the Roman Coliseum at a time when medieval Europe was still in the Dark Ages. Spirit and story begin with the land and the sky. The ancient people of the Americas knew this too. Many readers of Sundagger.net have told me they were awestruck by the sense of the spiritual upon visiting the ruins of Chaco Culture Natural Park. Here’s a short video of the ruins of Chaco Canyon with music by my son, Chris Goslow, that recreates this awesome feeling. Notice the sun dagger at the end. The primitive people saw, felt and witnessed the deep spiritual connection between earth and sky too. In the bottomland of a desert canyon sometime near the end of the first millennium, a native American climbed a butte and cut a spiral in the sandstone behind four 2000 pound boulders that just barely allowed the sunlight in. This artist positioned a 19-circle spiral so that, on the one day of the summer solstice, the center of the spiral was split by sunlight in the shape of a dagger. Furthermore, this spiral pecked out of sandstone was of an exact diameter so that, at the winter solstice, sunlight framed its outmost circle by two smaller daggers of light. Likewise, the equinoxes were shown with smaller daggers. What an artistic feat to show such brilliance and balance between earth and sky! And that’s not all. Great Houses and kivas, incredible feats of engineering, were constructed over centuries with their outer walls matching the path of the sun and moon light across the land at solstices and equinoxes. Visiting Chaco for the first time, I first “saw” the story I would come to call Sundagger.net when I stopped before a nondescript ruin of a small house, a house that called out to me with an ancient sad face and spoke of sweet dreams and great disappointment. I had just come home from Chaco where I had taken many notes on the land and its history. The first scene I wrote describes a man–he didn’t have a name yet–walking in a circle on the desert floor. It didn’t make much sense, except that it did. Sitting at my desk in Pinole, CA, I created my novel around this troubled man like you might if you drew circles without lifting your pen from the center point. The man became Rowan, a big boss at TekGen, a network communications corporation in Silicon Valley. Why is Rowan obsessively circling? He’s been taking photos of the wild turkeys in the Canyon, talking to them. He’s rethinking his business venture scheme and worrying about the young woman he convinced to come with him, who’s waiting back in the rented car at the Visitor Center. When finally he looks up toward the sky, he spots his ancestor, a primitive man in skins and feathers, RoHnaan. Spiral, my upcoming novel, takes on RoHnaan’s story, beginning with the young Willow, his mother, waiting at the deep, dry, jagged bank of Chaco Wash, frantically scanning the horizon for her much-older lover. The Anasazi too had their love affair with the sky beginning with the land. Their first structures were circular pit houses, underground mostly, entered through a hole in the roof by ladder, but by 800 A.D. they were building above ground, raising up to 5-story Great Houses with hundreds of rooms and no evidence that anyone lived in them, round kivas likely used for spiritual ceremonies, as are the kivas of the present-day Hopi and other Puebloan tribes. This past summer on my third trip to Chaco Canyon, when I came out of the only entrance to the biggest Great House, Pueblo Bonito, the interpretive ranger remarked that I was in the exact spot to watch the sun rise at its southern-most point on the winter solstice. She also pointed out that the east-west wall of Pueblo Bonito precisely divides day and night at the equinoxes, marking the middle of time. What happened to these pre-Puebloans called Anasazi (“Enemy Ancestors”) by the Navajo arriving three centuries later? Earth, Sky, Spirit. Story. Before the sun dagger, there was the spiral. Each time the Anasazi migrated, they left behind a spiral to show they were leaving. Why? There are so many questions to ask, so many secrets remaining. Spiral by Margaret C. Murray. Coming in 2015. “It’s a mystery in another dimension”, as famed Southwest mystery writer, Tony Hillerman, said about Sundagger.net. So might he say about Spiral. I was on the seventh day of my road trip. After days of driving and camping—interspersed by a stay in Flagstaff with my friend Joyce—I had finally arrived at Chimney Rock, Colorado, the site of my upcoming novel, Spiral. I had been working on Spiral, a prequel to Sundagger.net, for five years now and I just had to go see for myself. I had to take the same pilgrimage my characters Willow and her son, Little Hawk, take after they flee their home in Chaco Canyon, New Mexico, and set out for Chimney Rock, the furthest outlier of Chaco culture. Driving from California on Highway 40 to Flagstaff and from there to New Mexico, I was intent on first spending a few nights at Chaco Canyon World Heritage Site where Spiral begins. The Pre-Puebloans (otherwise known as the Anasazi, a name given to them by the Navajo, meaning “enemy ancestors”) likely came the same way, from the South. Like me, these ancient migrants would have passed by the same red rock mesas. They too would be inspired, awed, by the deep color of the high desert, the vast vistas and endless sky. Maybe they too were anticipating a great spectacle–those ceremonies in honor of solstices and equinoxes held in the Great Houses of Chaco Canyon. The ancient people would have experienced rough travel without cars, wagons, wheels, horses or any other means of transportation. A thousand years ago, this same road would likely have been full of people migrating to and from Chaco to witness the sun’s return or thrill at the lunar alignment. What a surprise when I turned a rocky bend and saw Fajada Butte. How close and massive it seemed from the dirt road, like a cathedral carved from sandstone. 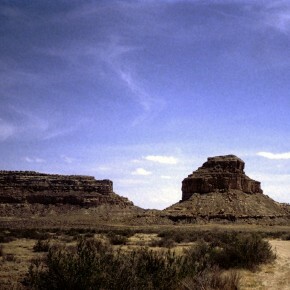 I’d been to Chaco Canyon two times before but never approached it from the South. I felt a strange kinship with this great rock. At Gallo Campground in Chaco, the wind blew my tent away before I even got it secured in the ground. With the help of the campground host (from Vallejo, Ca! ), I tied it to heavy metal rings. I slept that night surrounded by mesa walls, greasewood and blowing sage. The Pre-Puebloans would have come through the South Gap into the Canyon. On the far side of the gap are more than 50 pit houses. Are they “motels” the migrants camped in while at Chaco? Across Chaco Wash is Pueblo Bonito, the grandest of the Great Houses, where I stood while taking this photo. Debbie, the interpretive ranger who took me on a tour of Pueblo Bonito, said the arriving visitors likely might have been thrilled by the noisy celebration, the singing in many languages, dancing and music from flutes, conch shells, rattles, foot drums and more. So many people to see the show! Was it like our rock concerts? Disneyland ? Or like High Mass at St Patrick’s Cathedral? Who knows? The only evidence are ruins and potsherds. There’s so much mystery here. Leaving Chaco Canyon reluctantly (and missing the Full Moon ceremony), I drove to Navajo Lake where I camped a few days and then headed northeast over the Colorado border to Chimney Rock. And now, finally, I’ve arrived. Even from so far away on the road, I am repelled first sighting the mountain. It’s chilling just seeing bulbous Companion Rock and high narrow Chimney Rock on a dark mountain of chert and lava rock. I’m amazed at how close my feelings are to the atmosphere of terror pervading Spiral that Willow is so desperate to flee. Still, looking out of my car window, I take comfort in all the mailboxes along the road, proof that ordinary people live beneath this mountain that appears so isolating and ominous seen from afar. After setting up my tent at Ute Campground, I drive to the park entrance and learn I’m not even permitted to go up Chimney Rock alone. So instead I and five other tourists take a fascinating guided tour with Wayne, an interpretive guide and volunteer. Today Chimney Rock is the powerful landmark and spiritual center for the Pueblo People–the Taos, Acoma, Zuni, Hopi, Tewa and more. The two towers signify the Twin War Gods of the Taos Pueblo who slay monsters to help their People. The war gods are also revered by the Navajo who know them as Monster Slayer and Born-for-Water. War Gods? Yes, of course! After my climb to the top, I understand why. As far as I could go! Recently my eldest son and music artist Chris Goslow and I talked about putting together a special gift bundle that is truly “all in the family.” We decided to offer a book/album package at a big savings. For a limited time, you can purchase and enjoy my books, Sundagger.net and Dreamers, along with Chris’ albums, Waterfall and I Love You . Click HERE to see more about the mother & son bundle. Margaret: Three years ago Chris and I offered a Holiday Mother-Son Bundle for the first time, and I loved that experience. I was living up North in Sonoma County and would take the inscribed book and CD packages to a rural post office in Graton, CA driving along beside the apple orchards and vineyards in the green, winter mist. It was so fulfilling to me; I felt one with nature, the season, and my writing life. Back then we each had only one product, but now we both are offering two artistic works–four altogether. That’s a real achievement! It’s a family affair, these coming holidays. And I am thankful, very thankful. When I want to feel even more grateful, I count my blessings. Blessing #1: You, my reader. How many mothers have a chance to sell their novel with their son’s CD? Maybe no one. Maybe I’m the first? I’m not Random House. I’m not Alfred Knopf or Penguin Books. Not Houghton-Mifflin. I’m one woman, a mother, with one novel and one small publishing company, WriteWords Press. But hey, this holiday bundle is testimony to one mother and one son’s best work done with their hearts wide open. This is special. I’m lucky. Beyond lucky, I’m fortunate. The music CD Chris created and produced is haunting and lyrical and I love listening to it–whether or not it was my son who had composed and performed the piano pieces. Still, yes, it’s even more sweet knowing I am his mother. To hear sample of Chris’ music and see the world of Sundagger.net, watch this video, Stones of Chaco Canyon. Sundagger.net, by Margaret Murray, a novel of one family, two worlds, and many lifetimes. 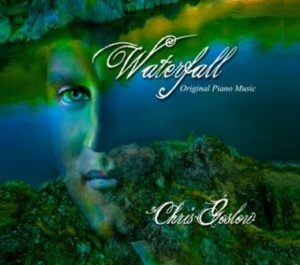 Waterfall: Original Piano Music by musician artist, Chris Goslow (wwww.chrisgoslow.com). Only $24.95 (plus tax) for both book and CD. Extended Savings! 20% Off if purchased by January 8th..
May your holidays be full of blessings.